What an incredible whirlwind of a trip BlogTour was. Design 24 hours a day with nonstop visual inspiration. Thanks to Heathrow and the good people at Virgin Atlantic, I have my laptop back and am ready to share some of this amazing experience. As I just returned yesterday evening, I am still in the throes of processing all that I saw but one theme was abundantly clear – the juxtaposition of old and new. This was especially evident at the beautiful Victoria and Albert museum, where the London Design Festival had several stunning installations. One of the most publicized was iconic design purveyor Murray Moss’ curated “Industrial Revolution 2.0: How the Material World Will Newly Materialise.” Working in conjunction with eight designers, he commissioned 3D printed projects to be created (printed) in one piece by Belgian 3D printing pioneers Materialise. Although 3-D printing has evidently been used for years by the medical profession, this show presents the artistic potential for the concept. 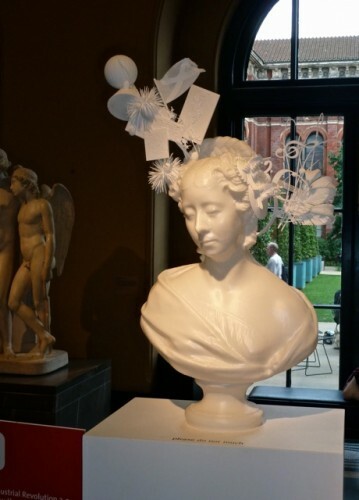 This magnificent melding of old and new is perfectly illustrated above by millinery designer Stephen Jones‘ ode to Lady Bellhaven, a bust from 1827 in the V&A sculpture court. Inspired by her supposed relationship with Chopin, his “tra la la tiara” has musical notes woven into its ornate design. And it’s not just the hat that is printed, but the entire bust!! 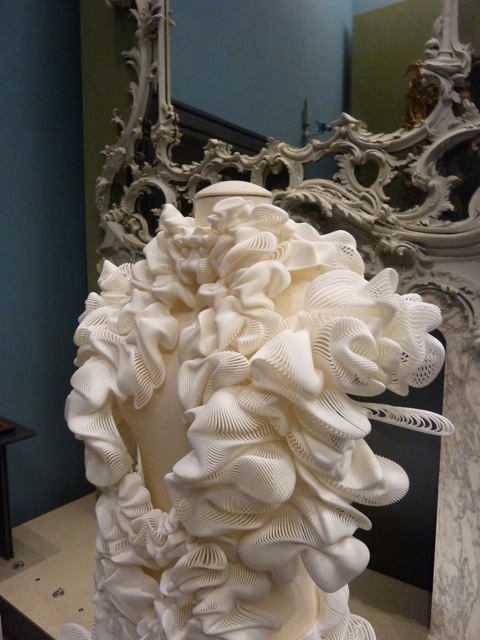 Materialise scanned and made a digital clone of the bust, then printed it in one piece with Jones’ imagined hat – amazing!! In our ultra speedy tour of the museum with the BlogTour team, we didn’t get to see the whole exhibit, but my other favorite piece was this extraordinary Escapism Dress created by Dutch fashion designer Iris van Herpen, part of a continuing collaboration with London architect Daniel Widrig. Juxtaposed with the ornate, I believe 18th century, mirror in the background, it’s an elaborate fashion statement of our times – timeless baroque detail created with cutting edge (pun intended) technology. Here is the dress on the runway at Iris’s fashion show in January. As 3D printing becomes more ubiquitous, stores who purchase such collections will have no shipping costs – they will receive the new designs by USB to print out at their shop!! The item that first sparked Moss’ interest in this technology was Patrick Jouin’s “One_Shot” stool, in the entrance to the architecture room in the V&A. If his name sounds familiar to readers, it might be because he designed the spectacular installation of the Van Cleef & Arpels Set in Style exhibit at the Cooper Hewitt that so entranced me!! 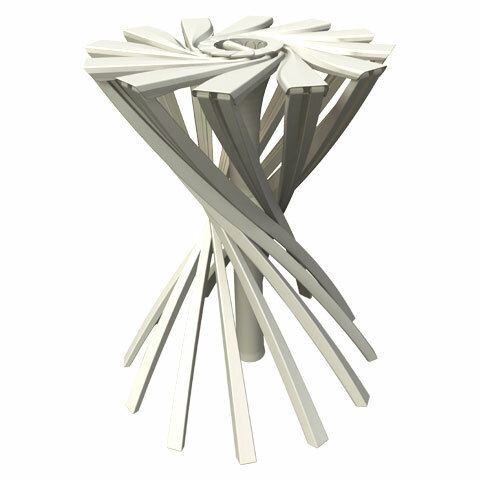 Laser printed in one piece (hence the name One_Shot), it has articulated legs that fold up like an umbrella or open easily to form the stool. 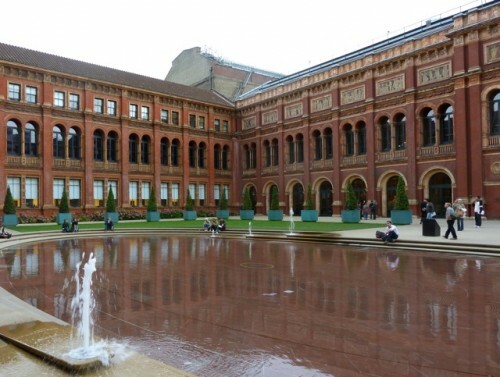 As Moss points out, there is a plaque at the V&A stating “The central intention of the Museum’s collections was to improve the quality of the “industrial arts” – designed and manufactured objects – in Britain, by placing the finest historical and contemporary examples before the public”. Even then they knew – the juxtaposition of old and new is the future of design!! He continues, “That’s what I think the purpose of museums is; to inspire, challenge, redirect and question. You should go through a museum questioning your whole life. That would be a good museum.” I couldn’t agree more!! This entry posted in art, BlogTour, design, learning, sculpture. Entry Tags: BlogTour, BlogTour2011, Iris van Herpen, Materialise, Murray Moss, Patrick Jouin, Stephen Jones, V&A, Victoria and Albert Museum Bookmark the permalink. Such a great trip you had! Was following along with your adventures via Twitter! Wow almost unheard of to get something back let alone a laptop, congratulations! Sounds like you had a very whirlwind holiday. I love museums and if they get you thinking they’ve done their job! Welcome home! “That’s what I think the purpose of museums is; to inspire, challenge, redirect and question.” Love that. Those pieces were so amazing to see. I love having more of the background info thanks to your post! And thank goodness for those Virgin Atlantic/Heathrow folks!! What amazing art using the most unusual materials! Glad to have you back and blogging. Inspiring designs, thank you for taking us on the trip with you! Couldn’t agree more that the juxtaposition of old and new is what it’s all about right now. Great post! What an experience! The 3 D creations are out of this world. So happy you got the laptop back and cannot wait to hear more in the coming days! Great photo’s can’t wait to see the rest of your trip! how interesting, love that dress. I can’t wait to see more! Welcome home. Sounds like a whirlwind of a trip. Love the visuals and can’t wait to hear more. Lucky you to sneak a trip in at this time of the year! Thank you for sharing Stacy! So beautiful. Welcome back, Q! Sounds like an amazing trip. Can’t wait to hear more. I love your perspective on the old and the new. Isn’t the V&A one of the most wonderful places in the world? I don’t think I could ever grow tired of it. Hope you are rested and settled and glad you have your laptop in hand so that we can take a virtual tour of London through your eyes! What a fun trip! I agree we should all visit museums, learn from history and new ideas and see what we can take from that in to our lives. This trip sounded Amazing!!! What wonderful new ideas and images to put in your head. Thank you for sharing some of what you saw with us. I want to learn more about Murray Moss. What an amazing collection of images, I can only imagine how remarkable it was to see pieces from the Design Festival in person. I love Stephen Jones‘ “Ode to Lady Bellhaven,” he is incredible, actually all of it is! I’m so glad your laptop is back, that must be an immense relief. These are stunning works of art. The printing process intrigues me completely I would love to see this creativity in action. That table is also a fine piece. What an exciting trip. WOW what a great blog post – the mind-boggling Escapism Dress is just extraordinary. So happy you got your laptop back – must have been a real relief. whenever I’m in a foreign country I make sure that I get to go on their famous museums. They say a lot about the country and its people. What an interesting and lovely post you have here. what a fabulous trip and opportunity to be part of such an event..
always wonderful to see what’s new at these museums when one travels..
can’t wait to discover more about your trip and the event..
Sound like you had a wonderful trip. This museum is a must see. It’s so nice to take the tour with your eyes and knack for getting great information. Great post, I’m looking forward to more! A tour with Murray Moss! I want to go next year! I’m going to have to continue moving backwards as I am hearing of a lost laptop and all sorts of inspirational and beautiful exhibits. You must have had a fabulous experience and I can’t wait to read more! Loved reading all about this amazing event, and viewing the museum through your lens. Great post and pictures. Glad to hear that you enjoyed Murray Moss’s installation and the tour with him (he has a gift with words). I was also there for the installation and had never been more proud of the company I work for, Materialise. 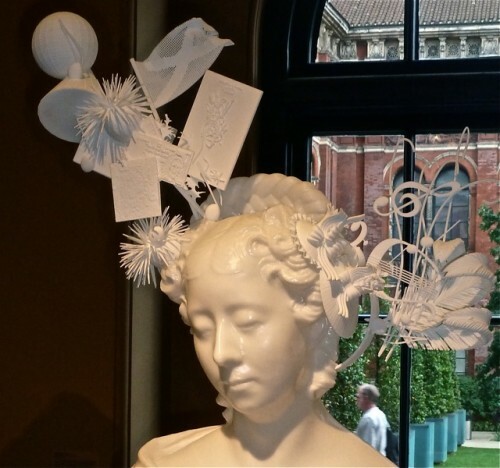 Just wanted to let you now that the installation was such a success that its stay at the V&A has been extended. Instead of ending on the last day of the London Design Festival, it will be in place until the end of October. So, all those that missed out during LDF, can still check these pieces out. 81 queries in 0.590 seconds.